You are a fan of iPods and also of a good coffee enjoyed in your cozy living room? Then look no further because I have the perfect item for you. 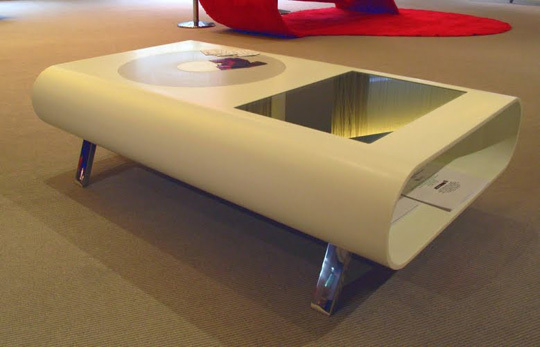 It is called the iTable, and it is a special coffee table designed by Italian artist Mirko Ginepro for Milan Design Week. The only resemblance with an iPod is the exterior design. The iTable doesn't sing but it looks great in your home. Made out of Corian, it is available on yellow, black and white. Regarding its dimensions, this special table is about 47 inches long, 29 inches wide and 13 inches high. Enough for the entire family to enjoy a good snack!